The Allegan Area Chamber of Commerce is pleased to present the 2018 Allegan Historic Sites Holiday Ornament. 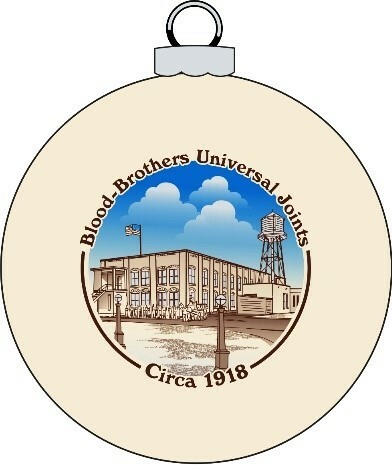 This year’s ornament features the Blood Brothers Machine Company shortly after its relocation to Allegan from Kalamazoo in 1914. Founded as a bicycle manufacturer, Blood Brothers, like many others in that industry, delved into the manufacture of automobiles at the dawning of that era. At the time, Blood Brothers supplied universal joints to automobile manufacturers and also manufactured their own automobile, the Cornelian. 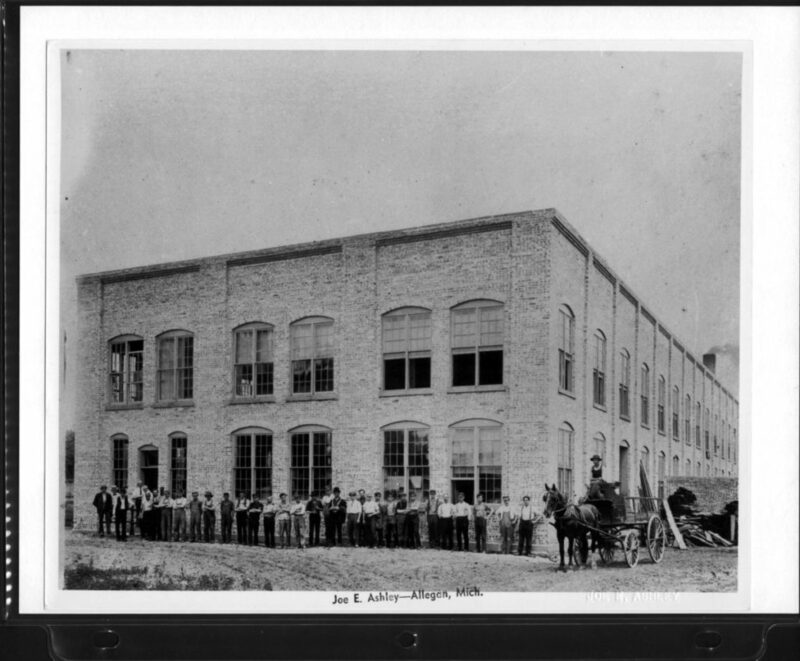 While production of the Cornelian only lasted until September of 1915, the manufacture and assembly of universal joints, drive-lines, and related parts would continue in Allegan for 78 years. 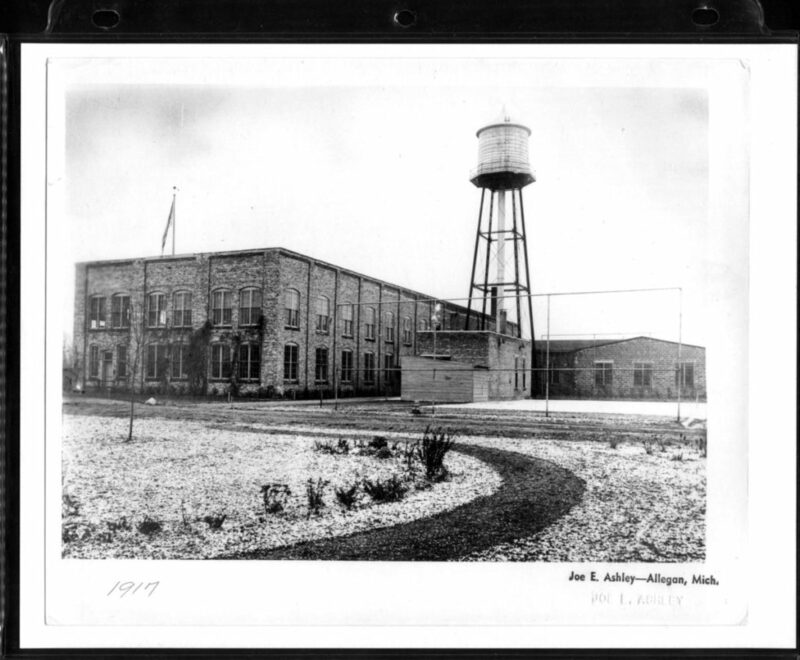 The plant played a role in all US armed conflicts since World War l and was so crucial to the manufacture of Jeeps during World War ll that armed guards with dogs patrolled the premises while a reported 900 employees worked at the Allegan plant. The United Auto Workers came to town in 1940 when Local 709 was recognized as the plant’s bargaining unit and, in 1945, the Blood Brothers Federal Credit Union began operations on company property. The plant continued to thrive and expand into the 1970s. By 1979, the Allegan facility was comprised of buildings totaling 343,000 square feet of floor space situated on 31 acres of land along the Kalamazoo River on the “Northside” of town. It manufactured a catalog of 20,000 parts and assemblies, shipped 25-million pounds of products, and paid $16.6 million in salary to its 750 employees annually. Alas, the lose of supply contracts for truck drivelines in the early 1980s forced Rockwell International to consolidate its driveline operations either in Allegan or at its facility in Fairfield, Iowa. The ratification of a concessionary contract by the Fairfield employees in conjunction with the State of Iowa’s approval of $1.4-million in grant funding which was contingent on the company shutting down manufacturing in Michigan all be sealed the fate of the Allegan location. The July 23, 1987 edition of the Allegan County News & Gazette reported that manufacturing operations would be moved to Fairfield, IA by June 1988. A skeleton crew would remain to assemble parts manufactured in Iowa until June 25, 1992. The legacy that Blood Brothers/Rockwell International built over its lifespan in Allegan cannot be overstated. The company provided good-paying jobs to hard-working employees. Local 709’s philanthropic outreach positively affected the entire community. The men and women who worked there were the same men and women that coached little league teams and were Girl Scout troop leaders. They were the leaders in of their congregations and Allegan’s fraternal orders and auxiliaries, clubs, and organizations. Blood Brothers lives on today in stories told at the local coffee shops and the lasting friendships formed on the shop floor. Ornaments are available for purchase at the Allegan Area Chamber of Commerce and Allegan Community Pharmacy for $15.00. A limited number of previous year’s ornaments are also available. Most of the information herein was condensed from James J Green’s book, From Blood Brothers Machine Company to Rockwell International, published by the Allegan County Historical Society (1978). This and Mr. Green’s other titles on the history of Allegan are available for purchase at the Old Jail Museum. Information regarding the closing of the Allegan facility is drawn from the Allegan County News and Gazette. Garneau, N. (1992, June 30). Allegan County News & Gazette. Green, J. J. (1978). From Blood Brothers Machine Company to Rockwell International. Allegan: Allegan County Historical Society. Young, D. T. (1987, April 9). Prospects Dim for Rockwell Staying Here. Allegan County News & Gazette, p. 1. Young, D. T. (1987, February 12). Rockwell Denies Closing Rumor. Allegan County News & Gazette, p. 1. Young, D. T. (1987, July 30). Rockwell Site Targeted for Clean-up. Allegan County News & Gazette, p. 1.